The following cases were heard under the Aroostook Criminal docket at the Houlton Courthouse during the month of September. 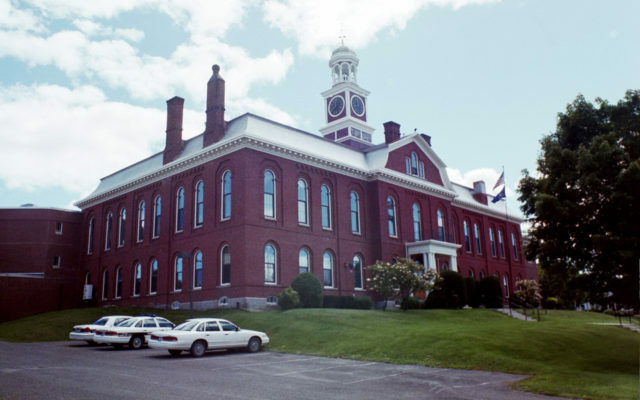 HOULTON, Maine — The following cases were heard under the Aroostook Criminal docket at the Houlton Courthouse during the month of September. Michael Grant, 34, Patten: probation violation, 60 days in jail, probation partially revoked. Kayla M. Bernabo,25, Oakfield: operating while license suspended or revoked (two counts), prior, $500 fine (each). Heather A. Sewell,49, Linneus: probation violation, 35 days in jail, probation partially revoked, probation continued. Jed T. Rollins, 56, Reed Plt. : probation violation, 18 months in prison, probation revoked. Brittany R. Scott, 32, Littleton: unlawfully furnishing scheduled drug, dismissed; unlawful possession of scheduled drug, $500 fine, 78 days in jail. Bud L. Nason, 24, Island Falls: probation violation, 52 days in jail, probation partially revoked. Ryan D. Cobb, 33, Danforth: criminal conspiracy, dismissed; unlawful possession of scheduled drug, $750 fine. Michael Lilley, 52, Monticello: OUI (alcohol), dismissed; driving to endanger, $575 fine, 30-day license suspension. Zachary W. Austin, 31, Oakfield: theft by unauthorized taking or transfer, priors, dismissed; theft by unauthorized taking or transfer, $500 fine. John T. Martin, 40, Houlton: theft by unauthorized taking or transfer, dismissed. Chelsea Putnam, 27, Houlton: probation violation, five days in jail, probation probation partially revoked. Randolph G. Tapley ll, 36, Houlton: unlawful trafficking in scheduled drugs, five years in prison all but two years suspended, two years probation, $240 restitution. John T. Martin, 40, Houlton: aggravated trafficking of scheduled drugs, $1,000 fine, 12 years in prison all but five years suspended, four years probation; unlawful possession of methamphetamine, dismissed; illegal possession of firearm (four counts), one year in prison (each); criminal forfeiture of property, forfeiture. Robert J. Greig, 33, Augusta: unlawful trafficking in scheduled drugs, $400 fine, seven years in prison all but two years suspended, three years probation, $120 restitution; aggravated trafficking of scheduled drugs (two counts), dismissed. Ronald Lycette, 58, Amity: theft by unauthorized taking or transfer, dismissed; violating condition of release, dismissed. Lisa L. Bishop, 47, Island Falls: stealing drugs, dismissed. Kierra Wood, 21, Oakfield: probation violation, 60 days in jail, probation partially revoked. Leslie A. Phelps, 40, Island Falls: domestic violence assault, 30 months in prison all but nine months one day suspended, three years probation. Jennifer Annett, 42, Houlton: assault, $300 fine, 30 days in jail. Darci M. Webber, 33, Easton: theft by unauthorized use of property, 30 days in jail. Robin Witham Jr., 30, Houlton: probation violation, seven days in jail, probation partially revoked. Joshua A. Morse, 39, Presque Isle: criminal trespass, seven days in jail; refusing to submit to arrest or detention, physical force, seven days in jail; disorderly conduct, offensive words, gestures, seven days in jail, $5 restitutution; criminal mischief, 48 hours in jail. Jonathan London, 51, Oakfield: criminal mischief, 30 days in jail, $940 restitution; criminal trespass, 30 days in jail. Jared Michael Patane, 29, Machias: unlawful possession of scheduled drug, $400 fine, 30 days in jail, $120 restitution; operating while license suspended or revoked, prior, $500 fine, 48 hours in jail; attaching false plates, 48 hours in jail. Jared W. Foster, 25, Danforth: sexual abuse of minor, dismissed; assault, $750 fine. Steven James Gonya, 33, Houlton: aggravated trafficking of scheduled drugs, dismissed; aggravated furnishing of scheduled drugs, $400 fine, five years in prison all but 24 months suspended, three years probation. Jasmine Donovan, 25, Houlton: OUI (alcohol), $700 fine, seven days in jail, three years license suspension; unlawful possession of scheduled drug, $400 fine, $400 suspended, seven days in jail, three-year license suspension; operating while license suspended or revoked, $250 fine. Kallie Prosser, 18, Littleton: operating vehicle without license, filed on $100 costs. Ryan Heath, 22, Houlton: violating condition of release, $200 fine. Todd Malesky, 53, Millbury, Mass. : operating snowmobile under the influence, $400 fine, 48 hours in jail; operating snowmobile to endanger, dismissed. Sabastian Nieves, 20, Fort Fairfield: improper victim contact pre-bail, 90 days in jail. Stephen McLaughlin, 58, East Millinocket: domestic violence assault, six months in jail all but 48 hours suspended, one year probation;domestic violence reckless conduct, dismissed. Stafford A. Goodman, 32, Presque Isle: unlawfully furnishing scheduled drug, $400 fine, 24 days in jail; unlawful possession of scheduled drug, dismissed; criminal forfeiture of property, forfeited. Rebecca L. Condon, 35, Oakfield: theft by unauthorized taking or transfer, $200 fine, 20 hours community service. Michaela C. Gray, 24, Houlton: unlawful possession of scheduled drug, $400 fine, 120 days in jail all but seven days suspended, one year probation, $120 restitution; unlawful possession of scheduled drug, dismissed. Jakob C. Britton, 20, Ludlow: OUI (alcohol), $500 fine, 150-day license suspension. Sabastian Nieves, 20, Caribou: violating condition of release, six months in jail. Brent Steven Shields, 55, Houlton: disorderly conduct, loud unreasonable noise, $350 fine. Chad Peterson, 27, Caribou: theft by unauthorized taking or transfer, five days in jail. Donald R. Scott, 25, Linneus: failing to make oral or written accident report, $500 fine. Jerry M. Larue, 64, Hodgdon: out-of-door burning violation, $100 fine. Michaela C. Gray, 24, Houlton: violating condition of release, dismissed. Durene L. Ritchie, 49, Houlton: domestic violence assault, dismissed; disorderly conduct, offensive words, gestures, $250 fine. Paul L. Brady, 34, Monticello: burning prohibited material, filed on $150 costs. Danica Thornton, 40, Houlton: violating condition of release, $100 fine; operating after registration suspended, dismissed. Kierra Wood, 21, Oakfield: domestic violence assault, 60 days in jail, $15 restitution; criminal mischief, 30 days in jail. Christopher Condon, 37, Houlton: criminal mischief, 10 days in jail, $290.13 restitution. Isaac G. Flewelling, 25, Houlton: violating condition of release, 30 days in jail; domestic violence assault, 90 days in jail. Brad T. Suitter, 26, Amity: failing to register vehicle, $100 fine. Rebecca M. Morales, 36, Island Falls: assault, $300 fine. Isaac G. Flewelling, 25, Houlton: theft by unauthorized taking or transfer, priors, dismissed; theft by unauthorized use of property, priors, 24 months in prison all suspended, two years probation; violating condition of release, dismissed; operating while license suspended or revoked, prior, $500 fine. Jason Suitter, 41, Houlton: OUI (drugs or combo), $500 fine, 48 hours in jail, 150-day license suspension; operating while license suspended or revoked, prior, $500 fine; failing to notify of motor vehicle accident, dismissed. Joshua G. Young, 27, Exeter: motor vehicle speeding: 30+MPH over speed limit, $300 fine. Jayme Lynn Green, 31, Patten: criminal trespass, $200 fine. Tammy Roach, 39, Sherman: trafficking in prison contraband, dismissed. Tiara E. Smith, 18, Bangor: unlawful trafficking in scheduled drugs, dismissed. Daniel J. Webber, 30, Bangor: unlawful trafficking in scheduled drugs, dismissed. Emily Jean Rush, 19, Houlton: operating vehicle without license-conditions/restrictions, $250 fine. Christopher Phillips, 34, Houlton: failure to register vehicle, $150 fine. Gunnar A. Briggs, 21, Orient: domestic violence assault, dismissed; violating condition of release, 23 days in jail. Kyra Scott, 26, Linneus: attaching false plates, $150 fine. Nicholas Merritt, 22, Linneus: operating while license suspended or revoked, prior, $500 fine. Michael L. Smith, 27, Providence, RI. : operating vehicle without license, $100 fine. Andrea N. Pipes, 34, Crystal: burning prohibited material, $100 fine. Mckayla Graham, 22, Houlton: criminal mischief, $200 fine, $200 restitution. Devin J. Smith, 24, Houlton: OUI (alcohol), $500 fine, 48 hours in jail, 150-days license suspension. Michael L. Smith, 27, Island Falls: operating vehicle without license, $150 fine. Michael C. Bennett, 27, Littleton: burning prohibited material, $100 fine. Scott A. Gardner, 52, Sherman Mills: attaching false plates, $100 fine. Denis J. Fore, 62, Houlton: theft by unauthorized taking or transfer, $300 fine; theft by unauthorized taking or transfer, dismissed. Justin R. Lovely, 36, Sherman: operating vehicle without license, $150 fine. Joshua J. Hall, 36, Oakfield: domestic violence assault, seven days in jail; violating condition of release, seven days in jail. Denis J. Fore, 62, Houlton: theft by unauthorized taking or transfer, seven days in jail, $26.98 restitution; theft by unauthorized taking or transfer, seven days in jail. David A. Grant, 53, Houlton: operating without safety equipment, $100 fine. Nicholas D. Gilbert, 30, Linneus: operating without safety equipment, $100 fine. Kasey Brewer, 27, Mars Hill: operating without safety equipment, $100 fine. Noah J. Bracey Ritchie , 20, Silver Ridge: minor transporting liquor, $200 fine, 30-day license suspension. Robin E. Calihan, 42, Lexington, Ky.: operating without safety equipment, $100 fine. Ronald Lycette, 58, Amity: unlawful cutting of trees by another, $200 fine, $2,000 restitution. Dean Nason, 39, Houlton: allowing dog to be at large, $50 fine. Kenneth York, 30, Calais: keeping dangerous dog, $250 fine. Melissa M. Beal, 34, Houlton: allowing dog to be at large, $50 fine; keeping dangerous dog, $250 fine. Tiara E. Smith, 18, Bangor: transportation of drugs by minor, $500 fine, 30-day license suspension. Daniel J. Webber, 20, Bangor: transportation of drugs by minor, $500 fine, 30-day license suspension.